Has anyone figured out a way to get their effects pedals within reach of their right hand for effect changing mid song? 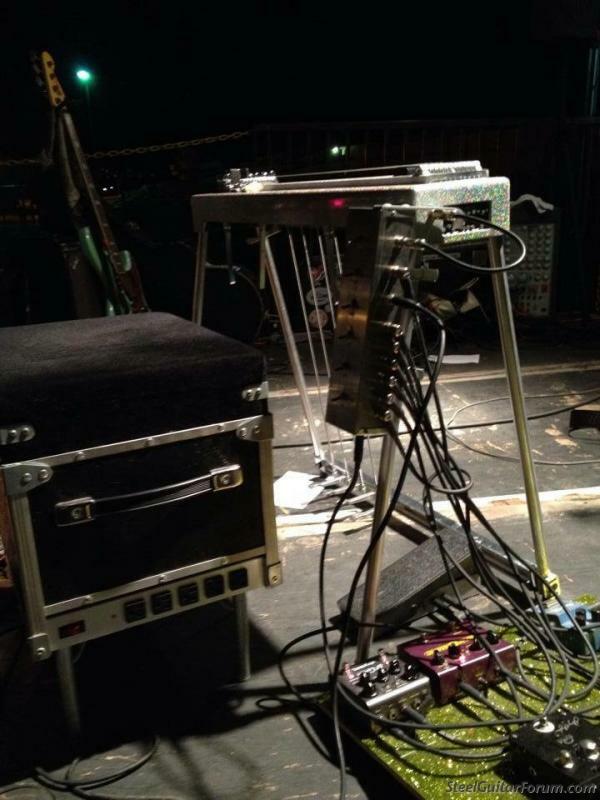 I'm imagining some sort of board that can clip onto the legs where i could put my Reverb & Delay. Any ideas? Something you've built? A collapsible milk crate works well. 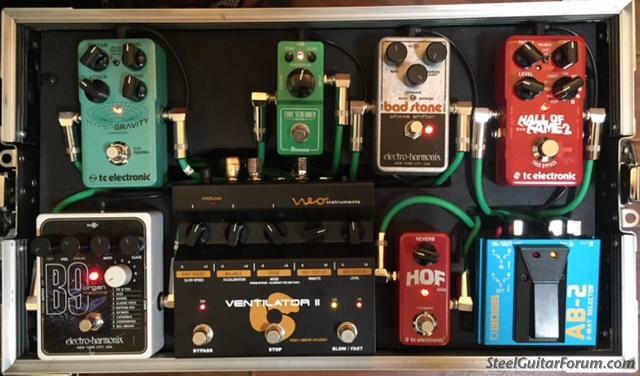 Flip it over and place your pedalboard on top of it. I love it! Thanks for the input & advice. 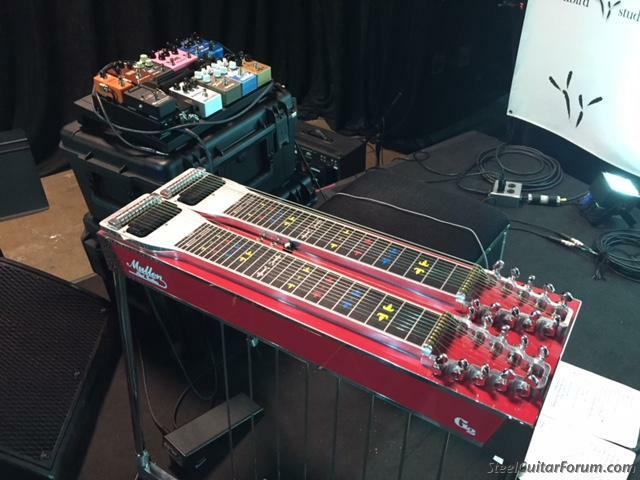 Chris Walke - that's exactly what i'm looking for, but something that could hold two pedals. I run a cathedral reverb & small delay, so something could fit both. Maybe Ron can make something custom like that. 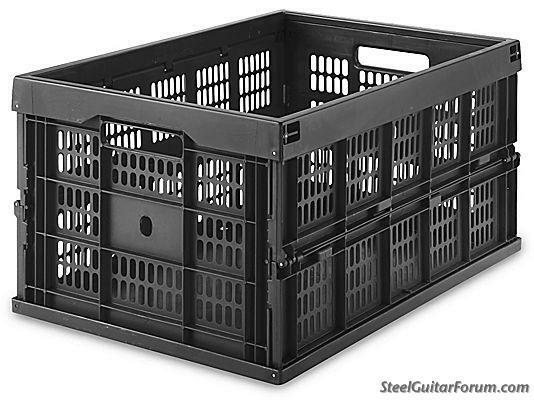 Also, a wooden crate might just be cheaper, hah! I asked that very same question on here a bunch of years ago, after a good couple years of having to reach down on the fly or do a little dance with my right foot to control my effects. After seeing all kinds of great solutions, I ended up wiring up a Hammond box with 3 true-bypass loops to switch on and off 3 pedals, generally one overdrive/distortion, one modulation and some time based effect, either a reverb or delay most often. 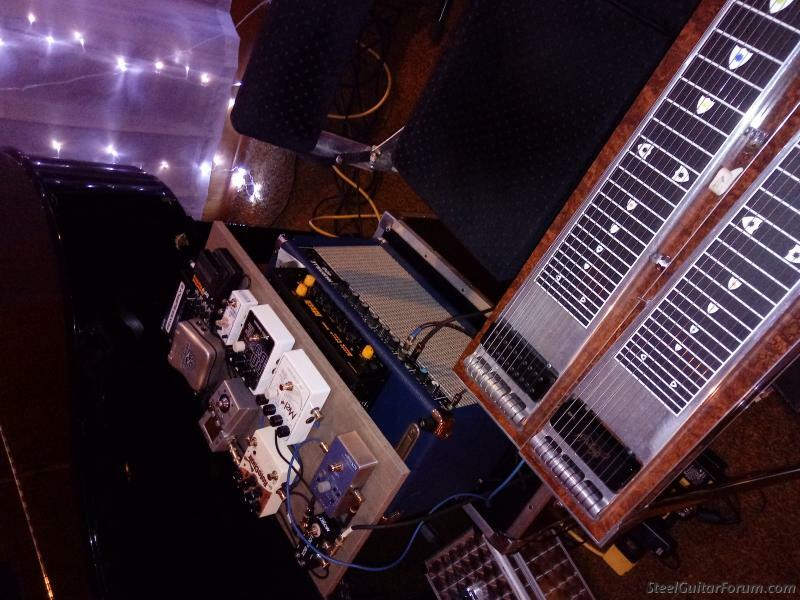 The top 3 switches control inputs that allow me to select between different instruments: pedal steel in #1, dobro or sometimes banjo get routed on #2 through a Fishman Jerry Douglas Aura pedal, and #3 tends to vacillate between electric guitar and lap steel. All the inputs route through the effect loops before routing to my amp. The box attaches to the right leg of my pedal steels with a couple large industrial spring loaded broom clips and a retaining bar to stabilize the box from incidentally turning. Sorry for the dark picture, got to take some proper ones! This is a Pedal Train sitting on top of the hard case it came with. These are a couple pieces of aluminum I bent to hang on a rack. 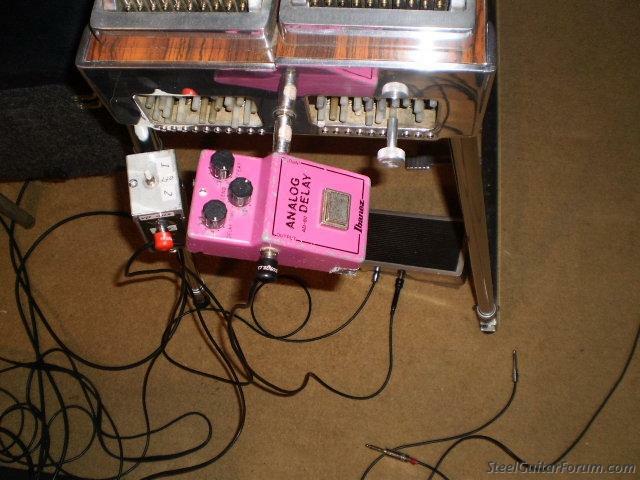 Some pedals on the second picture have changed. 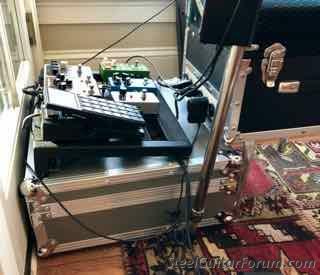 This works if you can use compact pedals...and have room to Velcro 'em underneath. 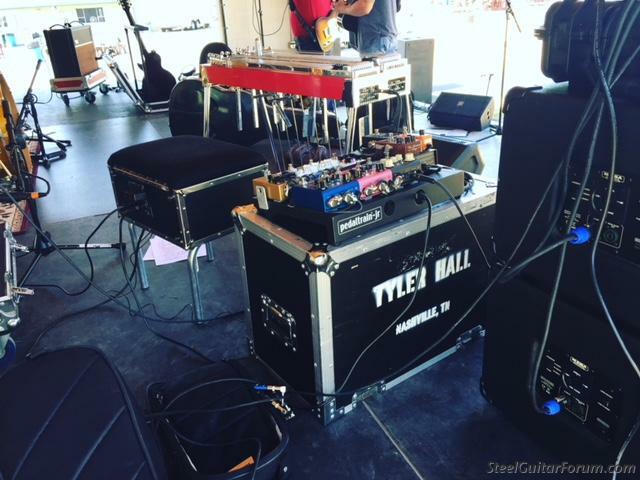 I never play steel on stage (always 6 string or bass) but have to wonder if y’all have ever looked into a remote switching system? Keeps all pedal out of the way, and all you have is a MIDI button gizmo... Voodoo Labs and others make some killer setups. I’ve got one of my stage setups this way, but with a non MIDI on/off box...whole lot less space in front, easy, safest for effects, etc. 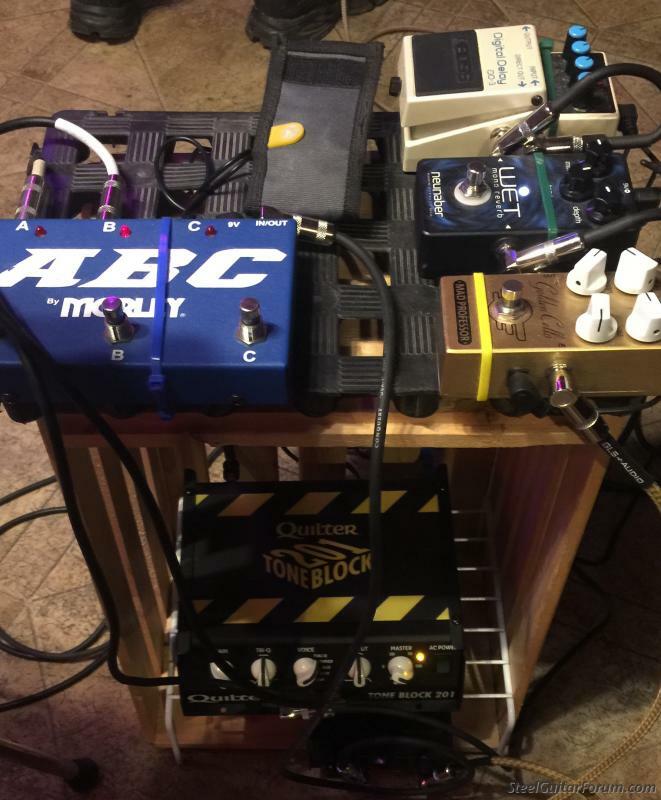 I eliminated all the stomp boxes when I built my first rack rig in the early 90's. 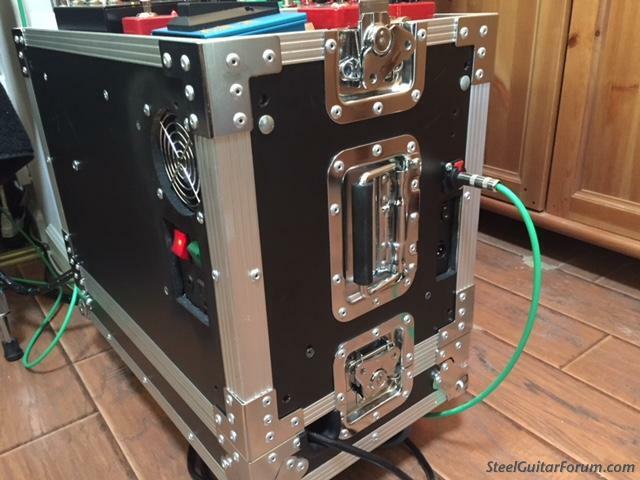 Everything I need for both steel and guitar are there. I can't understand why anyone would want to fuss with all those pedals when everything is available in racks that you can sit right beside you. Seems like that is regressing. OK, I lied. I still have this AD80 that I use when I take only a NV00. Stuck in the jack with a double ended male plug. Don't think I'll ever give this one up. The other thing clipped to the leg is an A/B switch. 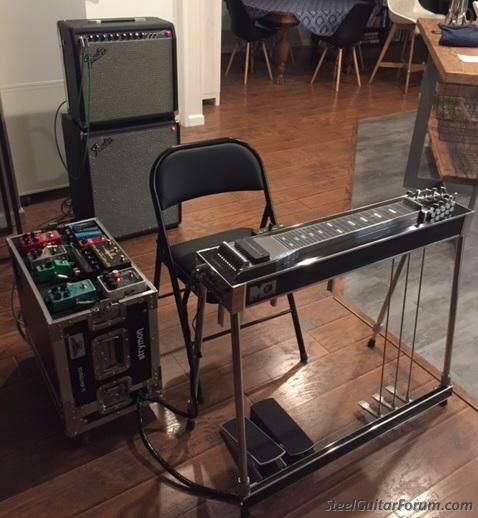 I too use the Pedaltrain Jr. board and use the hard shell case to raise it up so it is just within reach of my right hand. Easy pack up and the case is the perfect height. I am Bryant with Walker Seats. When I used more pedals, I used Velcro to mount them to the right end of my seat. I also mounted the power supply under the seat. Never had to move either foot or my left hand. I only use a Carbon Copy now for a little delay. I just leave it on my amp. A good evaluation of what pedals you actually use is also good. 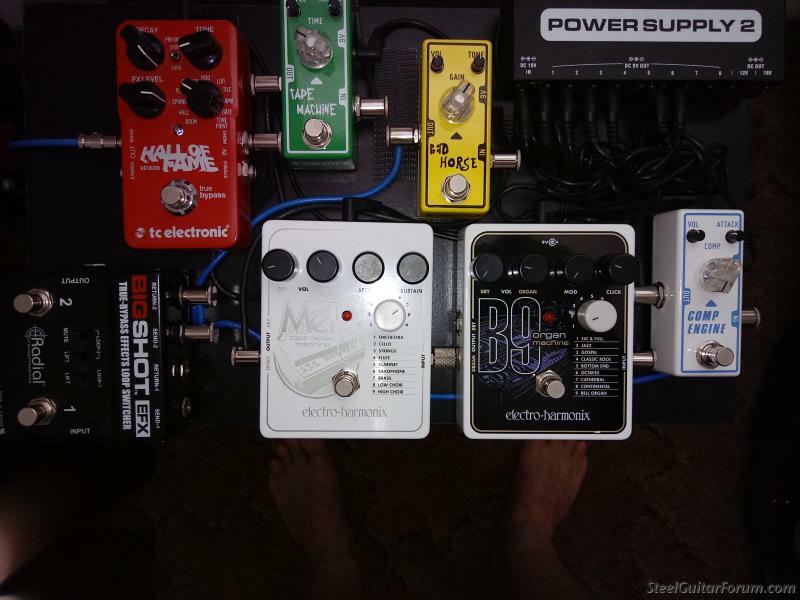 Jim Sliff, for those under the steel pedals, what is your power supply? 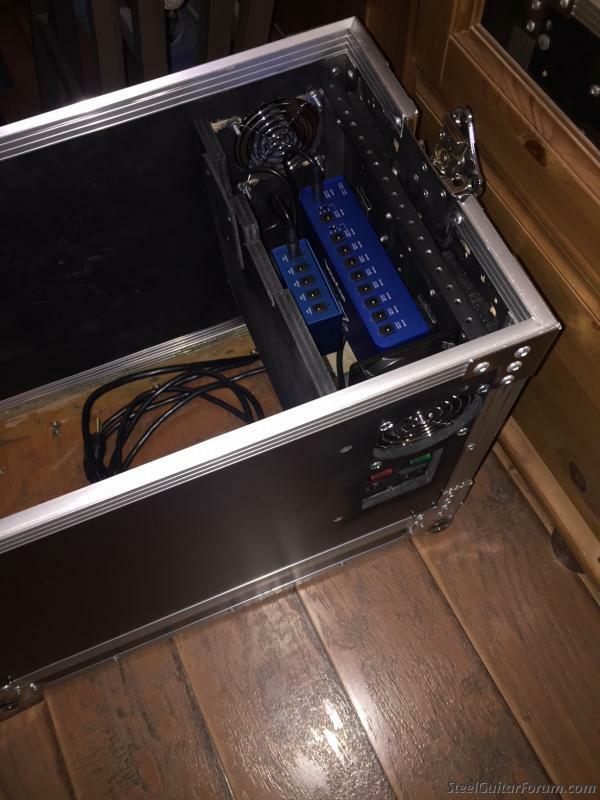 I built my effects into a rack case that sits next to me. Strymon power supplies inside w/fan and a DI built in. MCI Arlington S-10 3+5, George L E-66, Emmons bars, Fender Princeton 65W / Fender Rumble 200, custom FX rack, 1983 Dobro 60D, Martin D16GT, 1978 Rickenbacker 4000 custom. My touring pedalboard travels in a deep SKB case. I often put the board on top of its case and that works great. If I'm using an amp case, I use the top as a 'table' for my board and that works even better. All that is necessary ? The reason is simple:"tone". 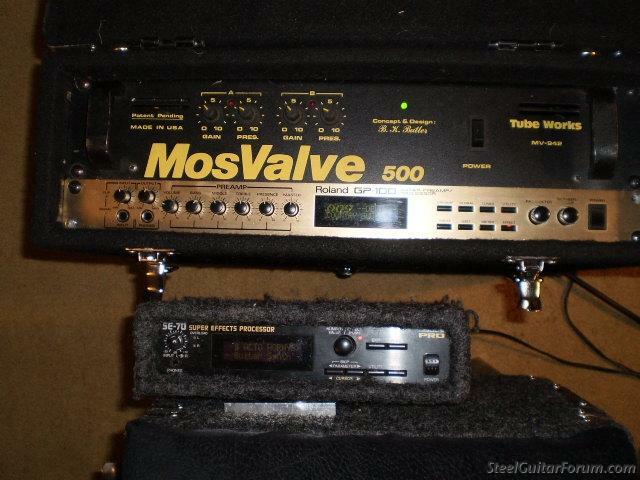 A multi-effects unit may not have the same sound as discrete pedals. With individual units you have the option of "tuning" the sound however you want and are not locked into the pre-programmed perceptions of the multi effects maker. Multi-effects units are primarily digital - and there are specific weak points in digital effects )some examples are distortion, reverb, delay, tremolo...) where analog effects are generally thought of as superior tonally. 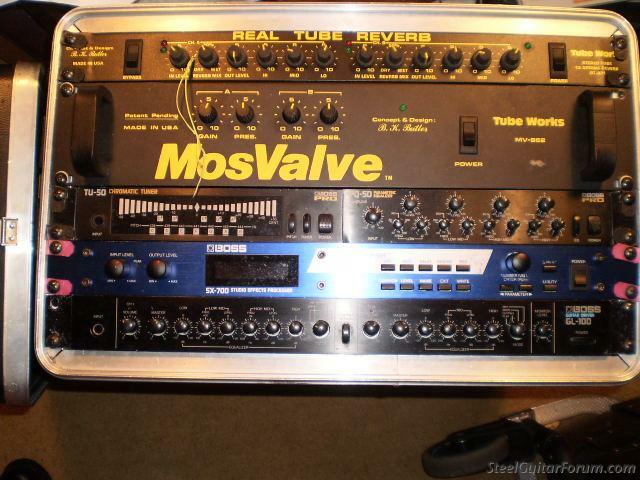 So if you want to play a convenient system, a multi effects unit may be your cup of battery acid. If, however, you are concerned with your tone, they may not be the best choice. (a very late reply to Tom - actually, he's been over here already - well, anyhoo - I power the on-board pedals with a One-spot power supply. there are several types that will work but pedal types...especially vintage units....need to bee considered as some need specific types of power and/or need to be placed in a daisy-chain power string. Visual sound's site has some good info. I keep my board on the floor right next to my Hilton Volume Pedal and my Wilson Wah pedal. I can reach over and push a buttom, quicker then you can turn around and flip on switch on a heavy rack case full of racked gear. I've never owned as many effect boxes as Buddy Emmons had, but i'm running a close 2nd. 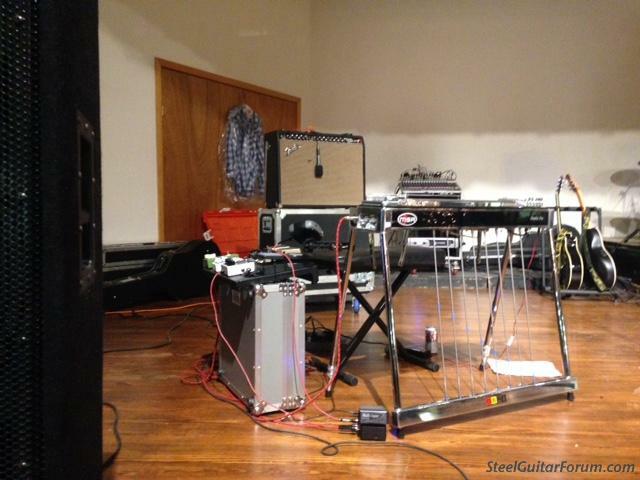 I don't like things hanging off my steel guitar. I have a Goodrich Matchbro on it, and a Peterson Strob Tuner, that's enough clamped onto a steel. 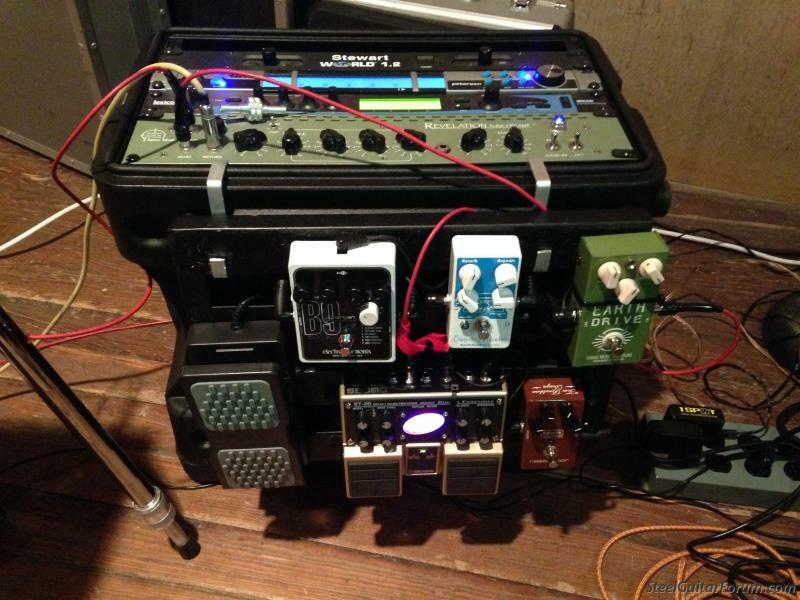 I use the Strymon Zuma power units. Best i've found, and i've tried them all. My Hilton Legend Delay, i power with it's own power source. Some of the effect units i use, you cain't find in any other format besides an effect pedal. 1. 90ish% of my jobs have me using a little touch of delay and some amp reverb. For that I carry a delay pedal in my packseat. I plug it in before I start, turn it on, and then turn it off again at the end of the gig. 2. However, for the 10% of my jobs that actually generate 90ish% of my income from playing, I use every one of the awkwardly many pedals on my touring board. 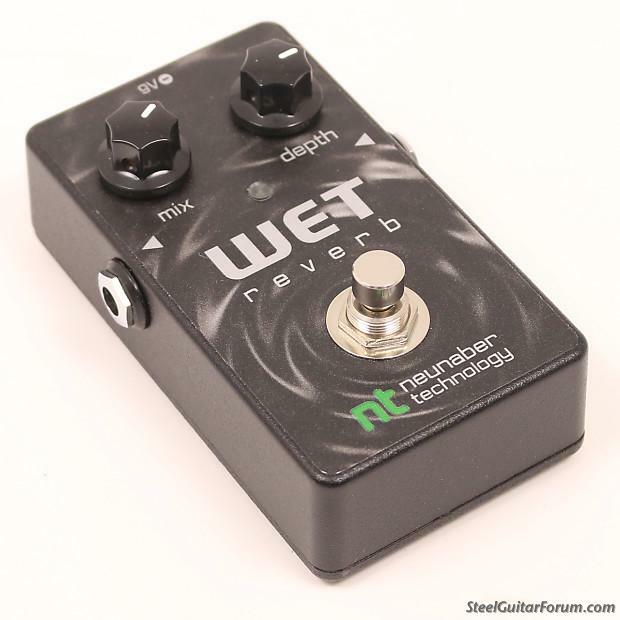 I'm probably called on to play a lot of things that much of the steel guitar world isn't but, at least in my world, the answer to "Is more than a reverb pedal necessary?" is "Absolutely."